When my sister called and asked me to make a dessert for her office party, I jumped at the chance to recreate an old favorite. Way back toward the beginning of Willow Bird Baking, I made some fun Ferrero Rocher Cupcakes in which I stuck a whole frozen candy into each cupcake prior to baking. I enjoyed those (despite the candy losing a bit of crunch), but always wanted to find the time to tweak the concept a bit. This was my chance! I wanted to take a moist chocolate cupcake, fill it with a giant dollop of the hazelnut-chocolate spread Nutella, ice it with rich chocolate frosting, and crown the whole thing with a Ferrero Rocher. The entire cupcake was designed to imitate the flavors in the candies themselves. And why stop there? 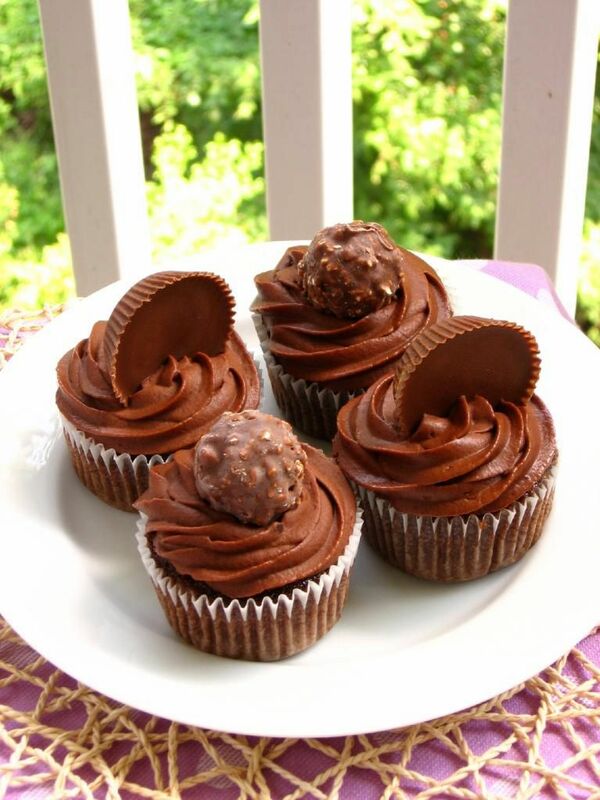 How easy would it be to fill some of the cupcakes with peanut butter instead, topping them with a huge Reese’s Cup? Hurray for candy cupcakes! I could have gotten even more carried away (cupcakes filled with coconut pastry cream and topped with Mounds? Cupcakes filled with caramel and topped with Snickers? ), but I reeled it in. That doesn’t mean we have to turn our imaginations off, though. What Candy Cupcake would you make? Now, I am Wacky McWackerson. I’m as silly as they come. But that’s not why these cupcakes are called Wacky Candy Cupcakes instead of just regular ol’ Candy Cupcakes. Raise your hand if you’ve heard of Wacky Cake! Anyone? Wacky Cake is NOT what you call the 2nd batch of cupcakes you make after ruining the previous batch and just barely convincing yourself not to throw your muffin pan across the apartment, spewing chocolate lava on your roommate’s couch (hey Barb! ), but good guess. I did make these Wacky Cakes after a first batch of chocolate cupcakes flopped, but that’s not why they’re wacky. Wacky Cake is actually just a vegan chocolate cake — no eggs, no milk — and is probably called “Wacky” ’cause vegans are just a little nutty sometimes . . . just kidding, just kidding! I love you, vegans! The truth is, no one really knows why it’s called wacky. Some say it’s because it’s a little wacky to make a cake with no eggs, which is just as good a reason as any, I guess. Regardless, Wacky Cake happens to be the perfect recipe to resort to after a flop that uses most of your eggs. Just call me MacGyver. Turns out, Wacky Cake is also yummy and rich — the perfect cupcake base for my creation. I went and added un-vegan ingredients to complete the recipe, but if you’re a vegan looking for a great chocolate cupcake, the base recipe here is perfect for you. It’s also just plain easy to make. The frosting, on the other hand, was a bit of a hassle. It doesn’t whip up very firm, so I had to refrigerate it for a bit and re-whip before frosting the cupcakes and sticking them in the fridge in a hurry. After sitting in the fridge overnight, though, the frosting is firm — and very chocolatey and delicious. I’d use it again for the taste, but I’d make sure to have refrigerator space cleared out ahead of time to chill the cakes immediately. Speaking of refrigerating these cupcakes, the Nutella jar expressly says not to refrigerate Nutella. Don’t worry — it’s not because the product turns toxic or anything, but actually because it firms up into almost a nougat texture, which for our purposes, is awesome. 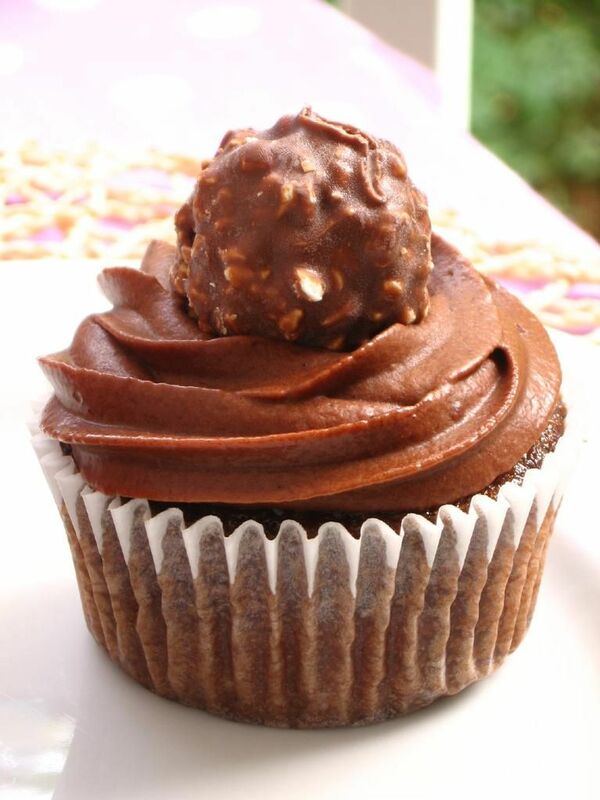 The center of the Ferrero Rocher Cupcakes was a hunk of hazelnut-chocolate love. Overall, these cupcakes were tremendous! I greedily devoured the few I kept to sample, and Sarah says her coworkers were enthusiastic about them as well! Both varieties are the perfect imitations of their respective candies, incredibly indulgent, and simple to make. If you’re used to making a plain cupcake-n-frosting combo, why not get a little feisty, add a sweet filling and a candy topping, and pump up your cupcakes? It’s a quick and easy way to turn a dull dessert into something special. Now it’s your turn: Think up a cupcake-version of your own favorite candy. Tell me about how you’d make it in the comments section — and bonus points for ACTUALLY DOING IT! Send me photos of your candy cupcake creations to post on Willow Bird Baking! NOTE: You may want to make these cupcakes the night before you intend to serve them, since the frosting needs time to set in the refrigerator. Preheat oven to 350 degrees. Line 30 cupcake wells with cupcake liners. In a large bowl, whisk together flour, sugar, cocoa, salt, and baking soda. Add vanilla, vinegar and oil, stirring until smooth. It’s normal for the mixture to seem thick and pasty right now. Add the water and mix (carefully to avoid splattering) until there are no lumps in the batter. Pour mixture into prepared cupcake pans. Bake 12-15 minutes, or until toothpick comes out clean. Allow to cool completely. Carefully hollow out each cupcake using a table knife, and reserving the scraps for another use (maybe cake balls?). Using a piping bag or a ziplock with the corner cut off, fill half the cupcakes with peanut butter and the other half with nutella. Make frosting: Melt the butter and stir in the cocoa. Alternate adding powdered sugar and milk, and beat to spreading consistency. Stir in vanilla. I refrigerated my frosting after beating to give it a thicker consistency, since it wasn’t as firm as I’d like. Unwrap all your candies while it refrigerates, because you’ll have to work quickly. Have a platter ready in the fridge to receive finished cupcakes (the frosting is not very secure until it’s been refrigerated for at least a few hours). Pipe a big rosette onto each cupcake, covering your filling, and plop the appropriate candy onto the middle. Place finished cupcakes directly in the fridge to sit for a few hours, and take out immediately before serving. Other fun candy cupcakes around the internet: 100 Grand Cupcakes, Snickers Cupcakes, another version of Ferrero Rocher Cupcakes. These remind me of the ones I made in February. They were so good I might have to make them again. I love that you stuck a whole PB cup on top of that cupcake- awesome! I loved seeing your version! They’ve been on my mind since my first version — I’d seen this guy: http://www.cupcakeproject.com/2007/12/ferrero-rocher-cupcakes-23-karat.html — and knew I wanted to make the whole cupcake into the candy! Just never seemed like the right time until now! Well., there you go. I knew one wasn’t to refrigerate Nutella, but never took it to the next step as you did; thanks for sharing that little tip. Cupcakes look amazing too BTW..
OMG thosee look AWESOME…you have given me the idea to now try to make cupcakes with the coconut almond raffaello candys. So yumm. Yay, Amy, love that idea! You could use the Coconut Pastry Cream from my Ugly as Sin Coconut Cake if you wanted — it’s so, so good. Or maybe even straight coconut? Mmm. Let me know how it goes! I am gonna do it next weekend I think!! I am inspired 🙂 I will be sure to let you know how it goes. Please do! I’d love to see pictures! They may be wacky, but they sure look delicious! The Nutella one really is tempting me. I love the candy on top! Those look amazing! 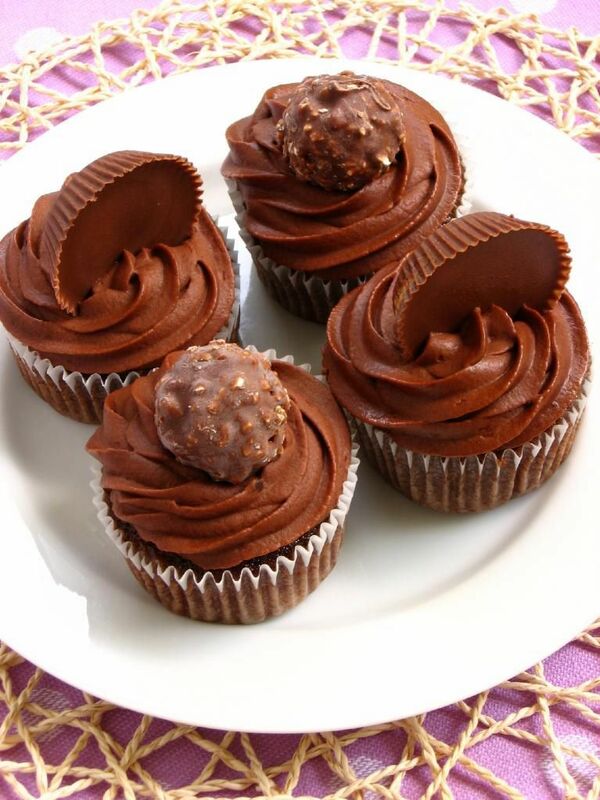 I love Nutella and Ferraro Rocher, and am excited to try making those cupcakes. Too funny! 🙂 Thanks, Natalie! oh my good-ness. So my mouth literally just fell open upon seeing these pictures. What kind of candy cup cake would I make? I think I would be quite content with the flavors you picked. Hit the nail on the head! 😉 It is almost 3 in the morning now and all I want is a Reece cup – cake. I will definitely be checking back in! 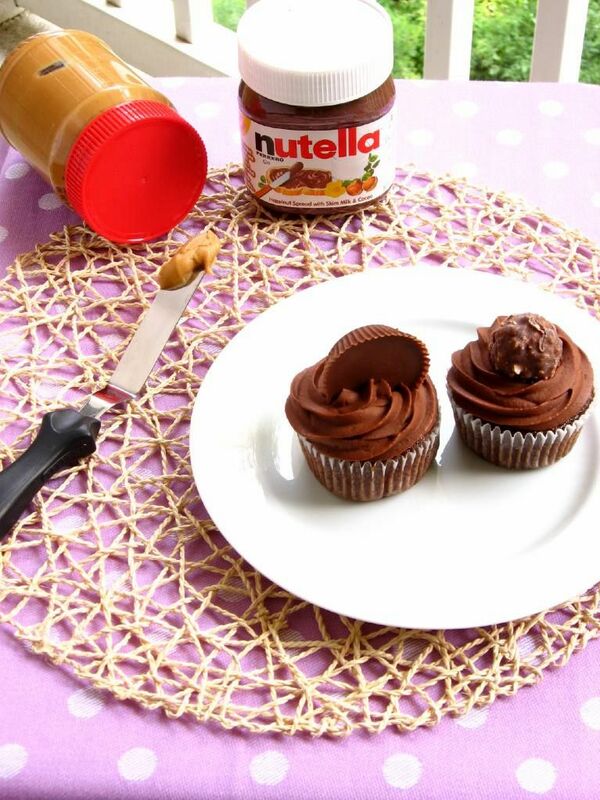 I would definitely go for the Ferrero Rocher cupcake…I absolutely love Nutella! My candy cupcake creation would be Almond Joy…a chocolate cupcake filled with some sort of coconut cream, topped with a chocolate frosting with chopped almonds. Now I just need a reason to make cupcakes! Yum!! Taylor, there’s a coconut pastry cream recipe on my Ugly as Sin Coconut Cake post that would be AMAZING in a cupcake! I read that too, and it’s more plausible, though perhaps slightly less silly 😉 Thank you! Oh yum! I love both of those candies! Oh my goodness gracious. Those look like evil sinful I-gotta-have-it goodness. Wow, if I could just reach through the screen and grab a bite! Wacky? Nope just wonderful! Ohh, this is madness. I love it! Hmmm … maybe a fleur de sel caramel cupcake? Yummm, Trix! Make it happen!! Oh dear Lawd, I think I gained 3lbs just reading this blog!! With a vegan/vegetarian family, the Wacky cupcake is going to be a hit. Next time I have some Cherry cordials (my absolute fave) I am going to try those in the center, perhaps with some Ameretto added to the icing. What do you think? Since my kitchen is my Happy Place, I can see me returning to visit you many many times in the future. Jacqui, thanks for visiting! I think your Cherry Cordial Cupcake sounds WONDERFUL! Hope you make them and love them! 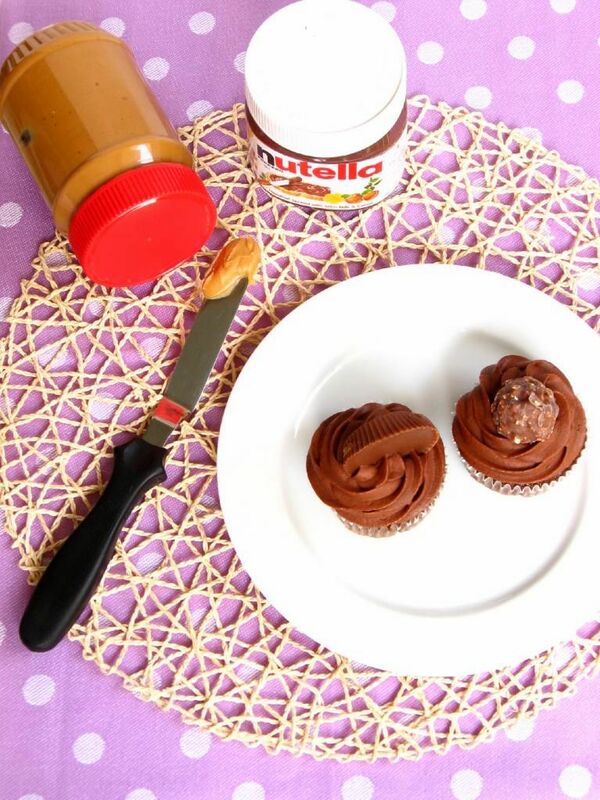 A Nutella filling sounds heavenly. I may just go get myself a scoop right now. Such gorgeous cupcakes. What a fun idea. I would have to give Milky Way ones a go. Ooh, Milky Way — sounds like a great idea! That frosting looks divine! The color is a unique chocolate color and it looks so creamy. I will be sure to clear out some space in the fridge for it though, thanks so much! I love these candy cupcakes. Problem or blessing-I would end up eating them all by myself. Um, I’m gonna go with the latter. What a great recipe! I should try to make a milky way cupcake…that’s my husbands favorite. Hmm.. Thanks, Natalie! I totally want to see your Milky Way version!! 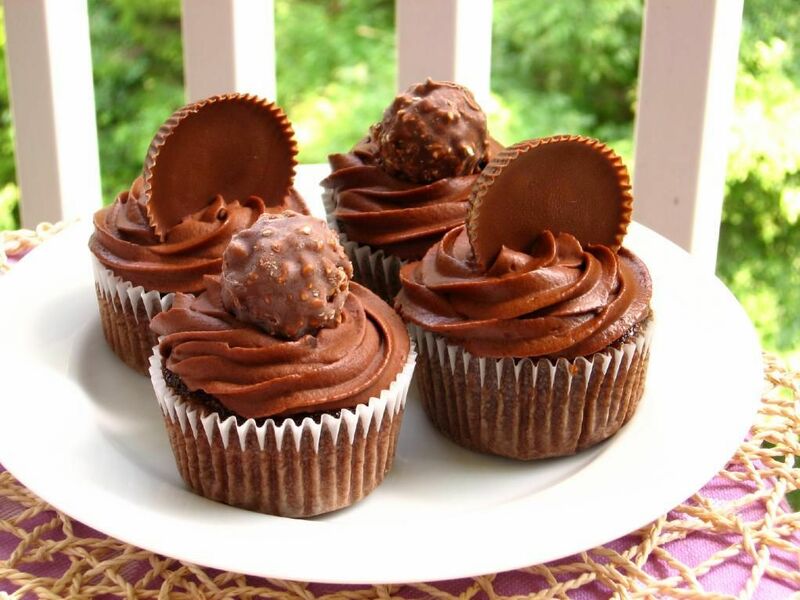 Oh, I’m all for the reese’s cup cupcakes. Yum. oh my god, i stumbled across your blog and saw this post and i just had to comment. these cupcakes look amazing!! i don’t know what candy I would use… you used the perfect combo. thanks for sharing! oh wow! I do love those Reese’s cupcakes too! I love the swirl of the chocolate frosting that ends with the Reese’s cup! Great job (as always). So creative! You are awesome. I would use Nutella and Rochers as well. That’s the perfect combo. And you’re like me in that you can’t just stop at one thing… there must be more than one dessert option! Chocolate lovers will definitely love these! The creativity is obviously there! It’s just like giving your cupcake more value than ever! No one will say no to ferrero rocher and reeses cup anyway! LOL Great desserts for all ages! My first inclination was to say I’d make something with a Heath bar, but then – shazam! Another thought crowded that one out of my head. I’d make New Orleans style pralines and instead of frosting, plunk a large spoonful of freshly cooked not-yet-set brown sugar goodness right on top of a chocolate cupcake, swirl it a bit and let it cool. These cupcakes are genius, thank you for the inspiration! I definitely want to try something with Heath bar, 1000 grand bar or, hmm maybe something topped with mini Toblerones. As for the “wacky cake” Have you run across (or come up with) any good vanilla style recipes? Thanks, Helen! I don’t know of a quick vanilla version, but I bet you could search for “eggless vanilla cake” and find one! YUM re: heath bar! One of my faves!! 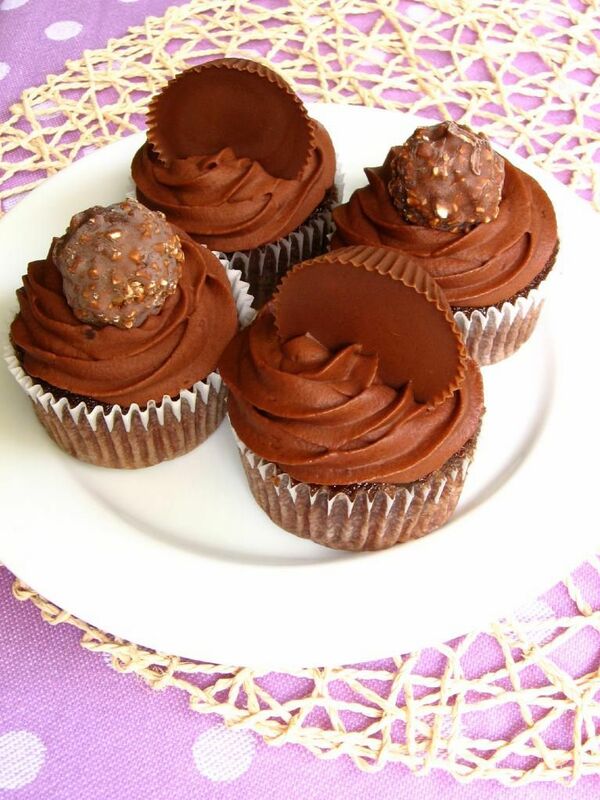 Ferrero Rocher and Reese’s Cup Cupcakes are absolutely great, they must bu so rich and tasty. I’m delighted with them! I’ve featured this recipes on my blog! I hope you don’t mind! If you don’t agree with that please contact me and I will remove it. All the best.